Whatever the motivation for deciding to pick up a club for the first time - perhaps watching one of the major championships on the television, or being encouraged by a family member or friends already enjoying the game - it is important to get in the swing as soon as possible and develop good habits. 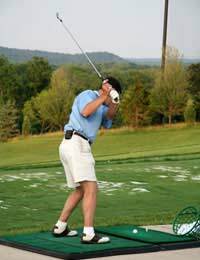 Too many would be golfers, particularly youngsters - head off to the local municipal course, hire a basic set of clubs and start hitting off the tee with no idea of how to hold the club, never mind striking the ball correctly. Even worse, there are those who limit practice to trying their hand in the local park - this is a dangerous and in many cases forbidden activity.The existence of the shouted warning "fore" on a course to indicate a ball in flight that may be closeto other golfers is not simply for effect. A golf ball struck with force is a potentially lethal projectile and should never be used without regard for either safety or surroundings. If golf sounds like a great idea, the sticking point to getting started can all too often be cost. After all, you need clubs, balls, tees, and in the case of many clubs a strict dress code must be adhered to that makes entry into the sport appear prohibitive. However, it is essential that such enthusiasm should be nurtured by means of the opportunities afforded bylow-cost alternatives. So why not start out by identifying the location of the local driving range, or a municipal course run by the council that will be relatively cheap in terms both of green fees and the hire of clubs. Many such facilities have practice grounds, which provide an ideal environment in which to get to grips with the basics. If there is a professional in residence, arranging some lessons will ensure that the new player begins developing good habits right from the off. This is a much better option than finding further up the learning curve that some of the lessbeneficial aspects of your technique are difficult to straighten out. Remember that some golfers find such bad habits can last a lifetime. In terms of lessons, the financial aspect again can be a constraining factor. However, it is worth approaching the council about assisted training schemes, some of which are run in conjunction with golfing associations. For example, the English Golf Union (www.englishgolfunion.org), the national amateur governing body, launched a Get Into Golf initiativeaimed at introducing more people to the sport regardless of age, background or gender, and together with the English Ladies' Golf Association organised a programme of free taster sessions, including hire of clubs, at participating venues across the country to do just that. Such initiatives mean that even if an individual does not have the money, they are still capable of participating and enjoying the game by making a much more important investment, namely the time to develop their skills and hopefully spread the word about the benefits of taking up the game.